Castelo de S. Jorge and Jeronimos Monastery will appeal to history buffs. Give yourself a bit of retail therapy at Avenida da Liberdade and Chiado. You'll find plenty of places to visit near Lisbon: Cabo da Roca (in Colares) and Sintra (Castle of the Moors & Mercearia da Aldeia). And it doesn't end there: take a stroll through Belém Tower, browse the eclectic array of goods at Feira da Ladra, and look for gifts at A Outra Face da Lua. To see reviews, maps, other places to visit, and tourist information, read our Lisbon trip itinerary planner. Philadelphia, USA to Lisbon is an approximately 11-hour flight. You can also do a combination of train and flight; or do a combination of train and flight. Traveling from Philadelphia to Lisbon, you'll lose 5 hours due to the time zone difference. Traveling from Philadelphia in March, expect Lisbon to be a bit warmer, temps between 64°F and 48°F. Cap off your sightseeing on the 19th (Tue) early enough to go by car to Albufeira. You'll discover tucked-away gems like Falesia Beach and Praia dos Olhos de Água. Head to Canastra and By Naturefor some retail therapy. Venture out of the city with trips to 11 Gourmet (in Loule), Lagos (Souvenir da Luz & Nandi Charity Shop) and QM Country Shop and Garden Center (in Faro). The adventure continues: kick back and relax at Praia Da Rocha, look for gifts at Garrafeira Lusitana, shop like a local with Olaria Pequena, and stroll through Praia Gale. For where to stay, ratings, more things to do, and more tourist information, refer to the Albufeira trip itinerary maker app . Drive from Lisbon to Albufeira in 2.5 hours. Alternatively, you can take a train; or take a bus. March in Albufeira sees daily highs of 65°F and lows of 50°F at night. Finish your sightseeing early on the 22nd (Fri) so you can drive to Evora. On the 23rd (Sat), look for gifts at Olaria Tavares, stop by Olarias of Sao Pedro do Corval, then look for gifts at Corticarte - Arte em Cortica, then pause for some serene contemplation at Igreja de Nossa Senhora do Espinheiro, and finally look for gifts at Tou c'os Azeites. 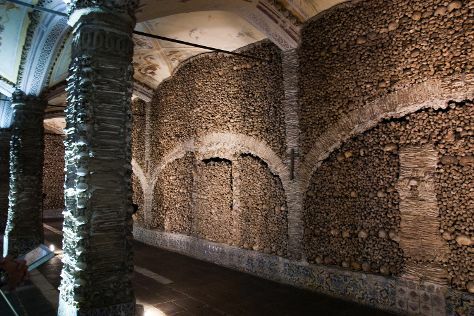 On the 24th (Sun), you'll have a packed day of sightseeing: look for gifts at Divinus Gourmet, contemplate in the serene atmosphere at Capela dos Ossos, contemplate in the serene atmosphere at Se Catedral de Evora, make a trip to Centro Historico de Evora, then stop by Gente da Minha Terra, and finally take in the spiritual surroundings of Templo Romano de Evora (Templo de Diana). To see maps, more things to do, traveler tips, and more tourist information, use the Evora trip app . Getting from Albufeira to Evora by car takes about 3 hours. Other options: take a train; or do a combination of bus, flight, and train. Traveling from Albufeira in March, you can expect nighttime temperatures to be a bit cooler in Evora, with lows of 44°F. Wrap up your sightseeing on the 24th (Sun) early enough to travel to Funchal. On the 25th (Mon), contemplate the long history of Blandy's Wine Lodge, view the masterpieces at Charlotte's CM Studio, stop by Perola Dos Vinhos Wine Shop, then stop by Bordal - Bordados da Madeira, then browse the eclectic array of goods at Workers' Market (Mercado dos Lavradores), and finally look for gifts at Dona Nita. On your second day here, look for gifts at Zumba Wear Madeira, stop by Fundacao Livraria Esperanca, look for gifts at Portugal Labels, look for gifts at Madeira Tradicional, then pause for some serene contemplation at Igreja de Nossa Senhora do Monte, and finally pause for some serene contemplation at Sao Salvador Church. To find where to stay, ratings, photos, and other tourist information, read our Funchal trip planner . You can do a combination of train and flight from Evora to Funchal in 6 hours. Traveling from Evora in March, plan for somewhat warmer nights in Funchal, with lows around 57°F. Wrap up your sightseeing on the 26th (Tue) to allow time to travel to Angra do Heroismo. Angra do Heroísmo, generally known as Angra, is a municipality and city on the island of Terceira in the Portuguese autonomous region of the Azores. 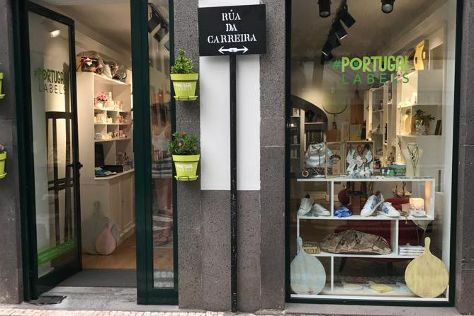 On the 27th (Wed), look for gifts at Queijo Vaquinha, steep yourself in history at Fortaleza De Sao Joao Baptista, get to know the fascinating history of Rua da Se, then stop by Atlantic Souvenir, then get a taste of the local shopping with Olaria de S. Bento, and finally stop by Ceramica da Praia. Here are some ideas for day two: get a new perspective on nature at Serra de Santa Barbara Interpretation Centre, then take a tour by water with Sailtours Yacht Charter - Day Trips, then look for gifts at Angra do Heroismo Park Shop, and finally take in the awesome beauty at Monte Brasil. To see more things to do, other places to visit, photos, and tourist information, go to the Angra do Heroismo online trip maker . Traveling by flight from Funchal to Angra do Heroismo takes 8 hours. The time zone difference moving from Western European Time (WET) to Azores Time (AZOT) is minus 1 hour. Finish up your sightseeing early on the 28th (Thu) so you can travel to Ponta Delgada. Kick off your visit on the 29th (Fri): stroll through Mosteiros Beach, explore the striking landscape at Caldeira das Sete Cidades, then look for gifts at Arrisca Experience, then look for gifts at O Rei Dos Queijos, and finally stop by Azorean Gift Shop. Here are some ideas for day two: browse the different shops at Parque Atlantico, look for gifts at Maviripa, then look for gifts at Louvre Michaelense, and finally look for gifts at O Principe dos Queijos. To see traveler tips, ratings, reviews, and other tourist information, go to the Ponta Delgada trip maker app . Traveling by flight from Angra do Heroismo to Ponta Delgada takes 4 hours. Alternatively, you can do a combination of taxi and ferry. In March, plan for daily highs up to 61°F, and evening lows to 54°F. Cap off your sightseeing on the 30th (Sat) early enough to travel back home.